When browsing through the massive amount of information out on the Web talking about what you really need to become a force while playing Hearthstone, one can come across some very startling (and depressing) numbers. While I have spoken before about the dust cost issue, I find that there are some even more sobering numbers out there. 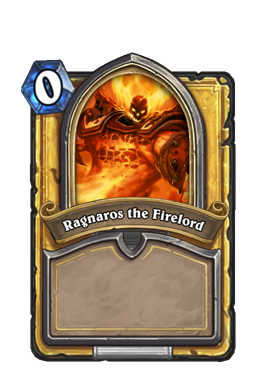 Our fellow contributor Sheng, for example, has a Beginner's Guide To Crafting Legendaries here on Hearthstone Players (well worth reading) that would recommend only 5 "core" legendaries that everyone should have access to: Dr. Boom , Sylvanas Windrunner , Ragnaros the Firelord , Alexstrasza , and Justicar Trueheart . Only 5. That's all. A mere 8,000 dust worth of purchases are all that is required to get on the road to relevance. This is excellent information to have, if you are in the position to buy or otherwise generate 8,000 Dust. But, what about those of us down here at the low end, parked out in the cheap seats? 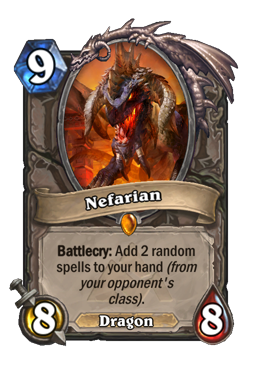 Can anything be crafted that will make us better Hearthstone players? 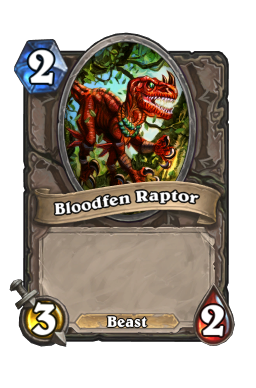 Is there any such thing as a list of cards that we should have to make our decks relevant? As a matter of fact, I believe that there is such a list. However, no one else that I can find has created such a thing so far. Therefore, I have taken it upon myself to create such a resource for us Free-To-Players - a list of the lower-end cards that I feel are essential cornerstones of developing decks. 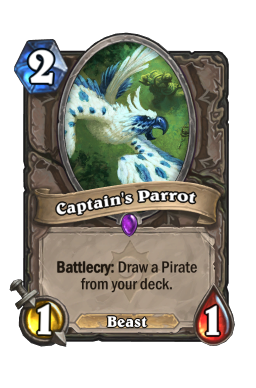 I will cover my "general" recommendations for the card you most want to have in Mana slots 1 - 6, and then will discuss the #1 card for each class that I believe is enough of an essential that it deserves to be in all your F2P or low-cost decks for that class. Fair enough? Also, a word to those who are concerned about the oft-repeated advice to "never craft common cards". I understand that there is an excellent chance that you will wind up with a duplicate (or two) of cards you have crafted as you continue to open booster packs if you continue to craft low-end cards. But a brief look at the numbers suggests that this is not as serious of a problem as it may at first seem. 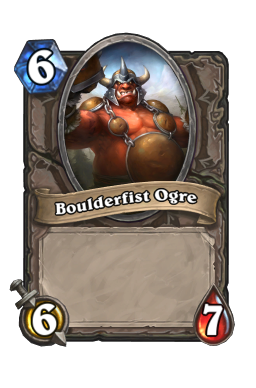 We are now a Base set and 2 Expansions worth of cards into the development of Hearthstone. The Classic set contains 245 (collectible) cards. 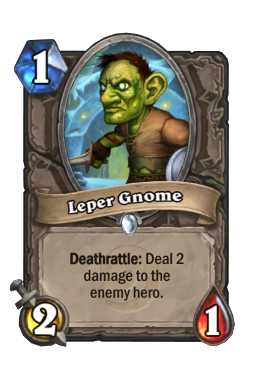 Goblins and Gnomes contains 123 collectible cards, and The Grand Tournament added another 132 collectibles to that list. Any time you buy a pack, your odds of grabbing any particular common card are: 2 % (or 5 out of 245) for Classic, 4% (or 5 out of 123) for G&G or 3% (or 5 out of 132) for TGT. 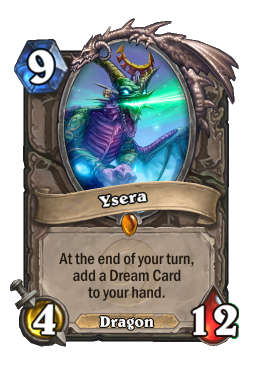 If these cards are coming from an Arena win, where you can randomly get a booster from any one of the sets, your odds drop to 1% (or 5 out of 500 cards) to obtain any particular card. To me, these are not winning odds, and I would rather create them than wait around for them. So, let's craft some low-end cards! Druid: Druid of the Claw . 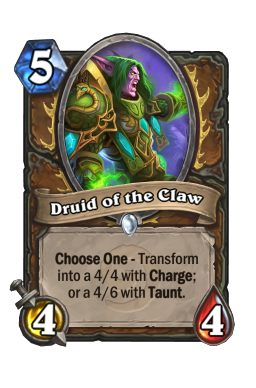 The Druid of the Claw is the most expensive of our Class cards, at 5 Mana, but I believe he typifies the Druid class as a whole. 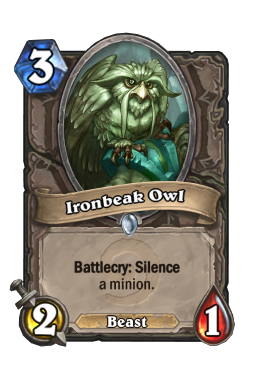 Most Druid decks are built with the idea that early-game minions are filler as the deck develops towards the true heavy hitters that will grant victory. The Druid is the first of those heavy hitters. 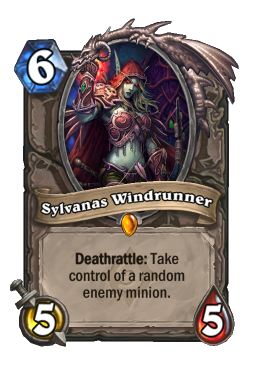 For 5 Mana you can pull out a 4/6 Taunter to slow your opponent's board development and give you a little breathing space. 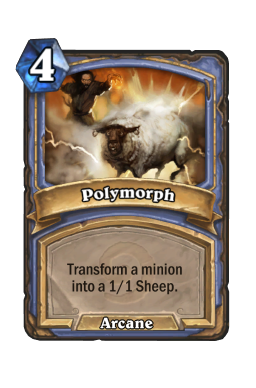 Or, for 5 Mana, you can lay down a 4/4 Charge Minion able to start wreaking havoc the moment he hits the board. 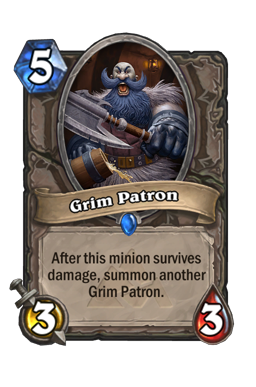 These two minions are located on the same card. 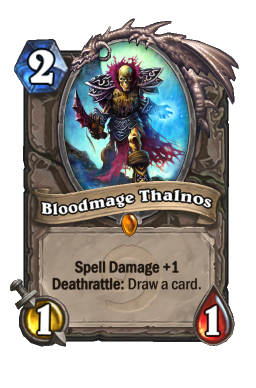 Card space is at a premium in Hearthstone - you have 30 slots to work with, and no more. Being able to fill two different tasks with the same card is typical of the Druid class, and it is best utilized here. Hunter: Glaivezooka . 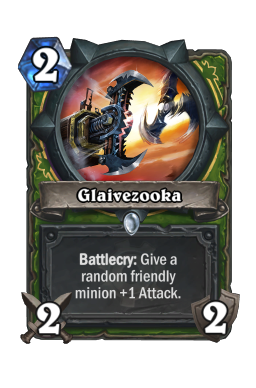 A staple of the Face Hunter deck, the Glaivezooka is worth placing into just about any Hunter deck due to its versatility. For the cost of 2 Mana it places a +1 Attack bonus on a minion, giving you additional Minion Attack pressure, then the weapon remains on your character providing you with essentially 2 free, aim-able Steady Shots. It is perfect for removing early opposing minions in a Control-style deck, or simply providing a little extra "Oomph" into your opponents's face when trying to burn them down as quickly as possible in a Face deck. No Hunter should be without it. 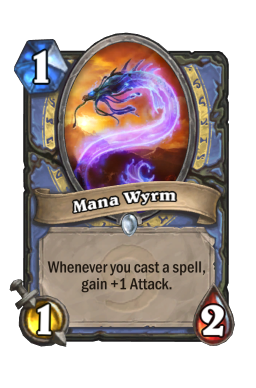 Mage: Mana Wyrm . 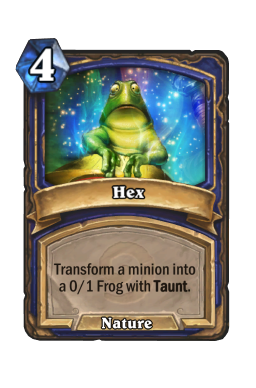 There may be those who disagree with me, but I firmly believe that the best thing you can do to immediately improve a "Basic" Mage deck is the addition of 2 of these little critters. The immediate problem for your opponent is that they just don't look very menacing, and are therefore frequently ignored. But the turns after you have summoned them, after the casting of a Mirror Image or an Unstable Portal or two, that can change rapidly. 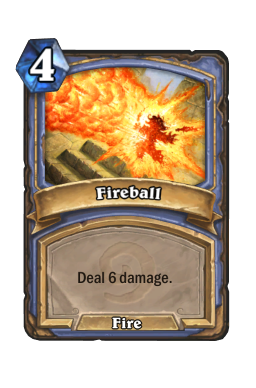 A Control-style Mage, brimming with Frostbolts and Fireballs, can very quickly find themselves armed with 4/3 or 5/3 Wyrms inflicting massive damage on the opponent's developing board or even their health. It is VERY easy to get a massive Value return off these little guys with a little planning in your deck design. 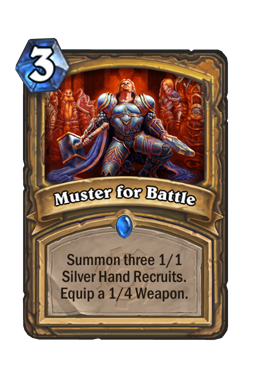 Paladin: Muster for Battle . 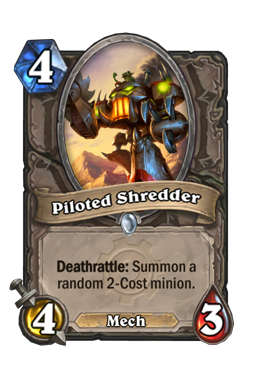 The card really typifies the Paladin play style. 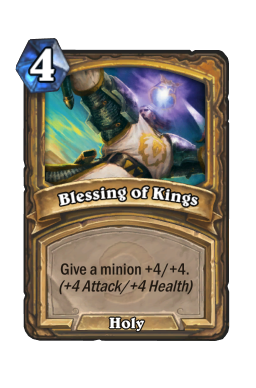 Turns one and two your Paladin has not done much of anything, on Turn 3 your opponent blinks - and he now somehow has to deal with 3 bodies and a weapon. 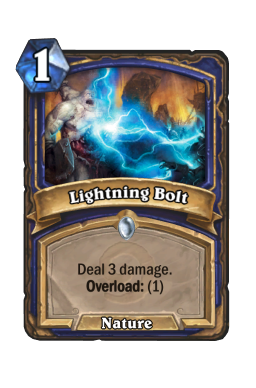 3 1/1 bodies and a 4-charge 1-damage weapon represent 7 points of Offense for only 3 Mana, an excellent return on Mana invested. 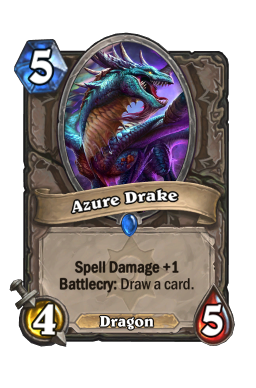 (Remember, a Mage's Fireball gives one less Damage for one more Mana.) 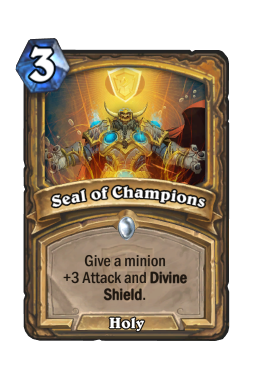 But given the existence of Blessing of Might , Blessing of Kings , Seal of Champions - these tiny little bodies can be turned into major offensive forces on Turns 4 and beyond. 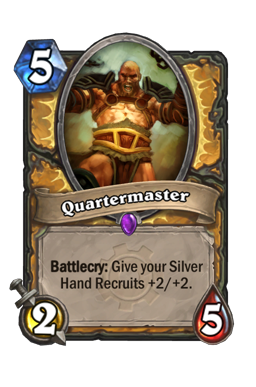 And if you manage to combo with a Quartermaster any time after turn 5 - many opponents will be instantly demoralized, and begin spiraling downward into defeat. 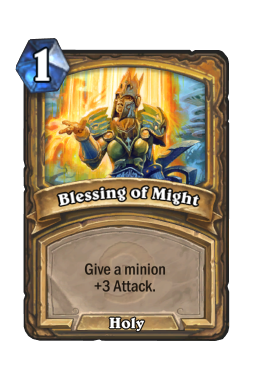 This card should be the starting point for most Paladin deck designs. Priest: Velens Chosen. Selecting a single card for many of these Classes required serious thought on my part. Not so the Priest class, and Velens Chosen. 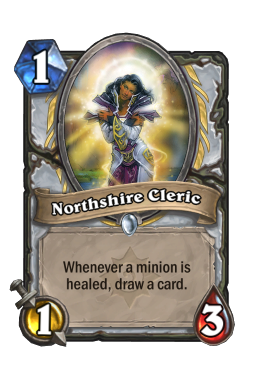 What other card can turn a meek and helpless little Northshire Cleric into a 3/7 Monster, also armed with +1 Spellpower? For only 3 Mana, no less. 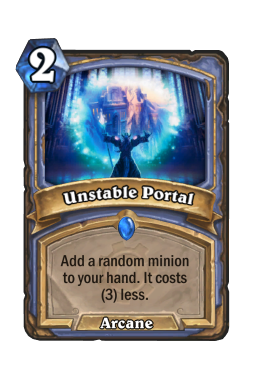 The amount of resources that can be required in the early game to get rid of a Priest minion enchanted with this card is enormous - it is very easy to get 2 or 3 cards invested by your opponent just to deal with the results of this one card. 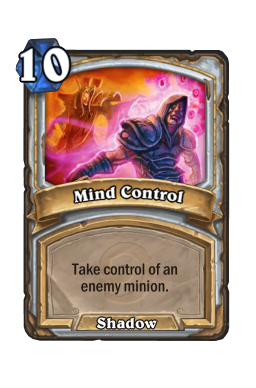 While their game grinds to a halt as they try to deal with the result of Velen's, you can be developing as you choose, leaving your opponent hopelessly behind in both Tempo and Board Control. A game-changer, in and of itself. Rogue: Tinkers Sharpsword Oil. 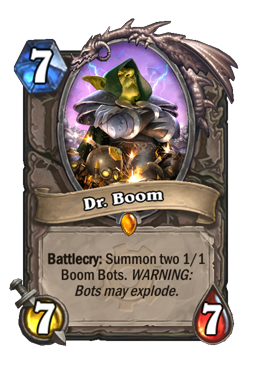 This card and its effect are so powerful that an entire deck and play style, the Oil Rogue, have developed around it. 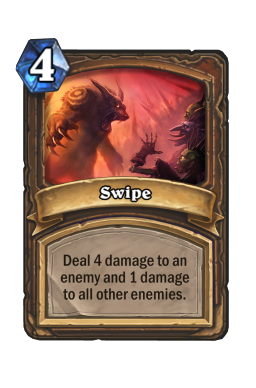 For 4 Mana, when used as a Combo, this card adds an immediate +6 Attack to your side of the board. This isn't a one-turn only effect either. As long as your weapon and the enchanted creature remain in play, this bonus will continue to apply - wreaking havoc on your opponent's board, or, more commonly, their health. 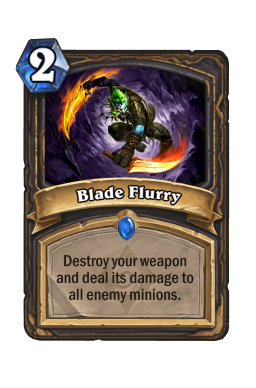 Used in combination with Blade Flurry this card can destroy your opponent's entire board and wreck their health, giving them no way to catch up with your enhanced offense. A Tinker's Oil applied to a freshly summoned Assassins Blade gives you a total of 24 Damage to hand out as you wish - an assault very few players are prepared to deal with. Embrace the Oil, and watch what it can do for your basic Rogue deck. Shaman: Stormforged Axe . 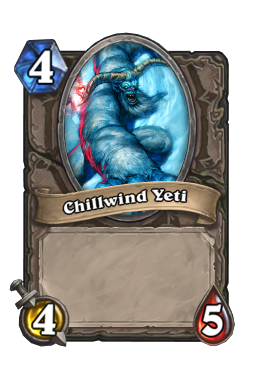 One of the greatest problems Shaman decks have is the struggle with the Overload mechanic - you get something this turn, but get crippled next turn because of it. 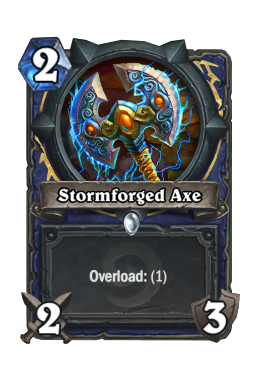 The Stormforged Axe is one of the few uses of Overload that allows you to stay on tempo - after summoning the Axe you still have 2 points of direct-able damage to use every turn for 3 more turns. 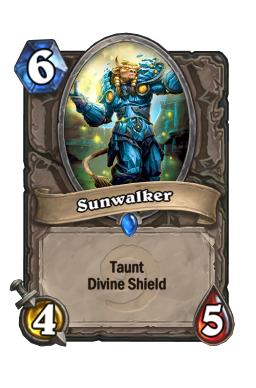 This allows you to respond to low-end threats, create gaps in Divine Shields, and, lacking other inspiration, to smack your opponent in the face for 6 total damage. The following turn after summoning the Axe you can still bring out a Totem and do some damage - sometimes the best you can hope for in the early turns of a Shaman deck. You need this tool to stay relevant in the early turns as your board develops slowly due to other uses of the Overload mechanic. 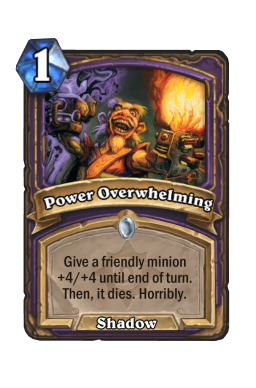 Warlock: Power Overwhelming . 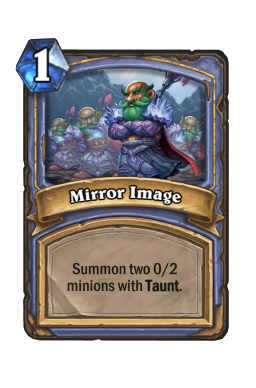 1 Mana. +4/+4. What more could a Warlock ask for? This is the tool that allows the Warlock to blow holes in defenses, remove annoying offensive creatures, even deliver killing blows. 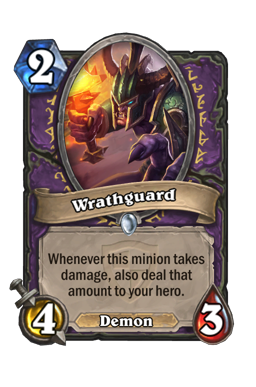 In short, Power Overwhelming turns any creature in the Warlock deck into a real threat. Only for one turn, true - but that one turn can be the difference between victory and defeat. 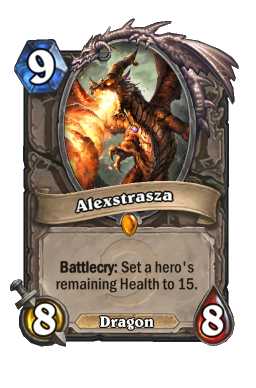 For extra fun, hang on to them till Turn 8 or later, then use 2 of them on a harmless Blood Imp and use it to take out your opponent's Alexstrasza or Nefarian , just to watch the smoke curl out of their ears. The joys of being a Warlock! Warrior: Cruel Taskmaster . 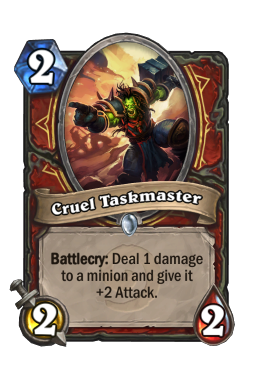 Back to the "Value" concept, there are few cards in the Warrior lineup that embody Value quite as well as the Cruel Taskmaster . 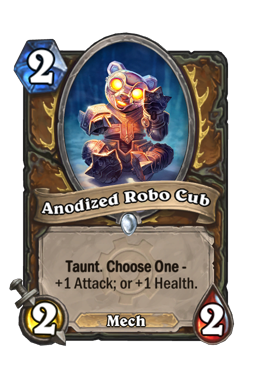 For 2 Mana you get: a 2/2 body, a direct-able 1-point strike, and potentially a 2-point attack buff. I have seen Taskmasters used to finish off wounded opponents, used to buff harmless looking allies into surprise threats, and most especially to trigger Enrages on allied creatures - giving both the +2 bonus AND the bonus from the Enrage effect. The +2 Attack buff is not temporary - it will remain wherever you place it, meaning that it can potentially continue generating value for you turns after it is applied. 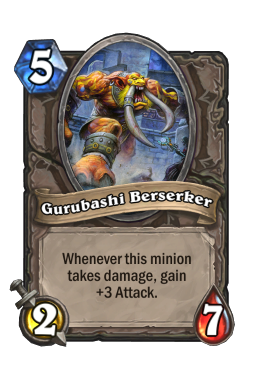 Combine it with an Axe Flinger , a Gurubashi Berserker , a Grim Patron - the possibilities boggle the mind. I am a firm believer that low-end decks can be made relevant, and are not doomed to spend all their time stuck between Ranks 25 and 21. 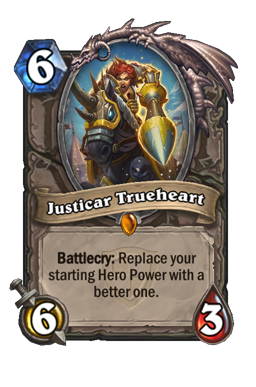 Spend a little time in the Arena, identify a few cards that you can live without and Disenchant them, and get to crafting some of the cards on this list! The improvements can be remarkable, if you are willing to put in a little time, combined with some spit and polish. Think I have hit these right on the money? Or maybe violently disagree with me? Feel free to let me know in the comments section below, or contact me via Twitter or on my blog if you are so inclined. 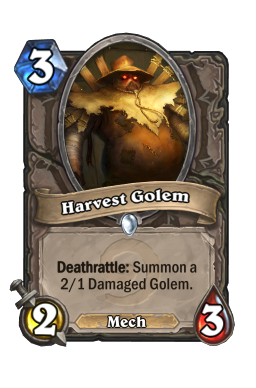 I hope to see you, and your must-have cards, on the Ranked Ladder soon! - Hawkwind Want more Life at the Low End? Take a look here and here. Thanks for reading!